Have you guys heard? 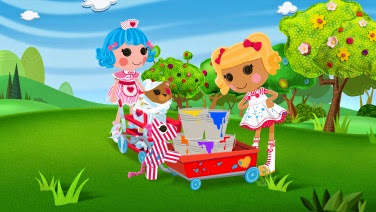 Lalaloopsy is finally on Treehouse and they're on Saturday mornings at 8am! I'm pretty excited because my daughter is a huge fan of theirs. She loves the dolls and how unique they look. She absolutely loves the characters and she got a chance to watch the show this week since we were out of town last Saturday for the long holiday. I made sure to record it on our DVR so she could watch it during the week. She's very excited to see it tomorrow morning. What I love about the show is that it focuses on teaching young girls about friendship, diversity and teamwork. Something all girls and boys should learn about. If you have a little girl make sure she tunes in tomorrow morning, it's always nice seeing the actual characters on screen and learning a bit more about their personality. My daughter absolutely loves the April Sunsplash doll she was sent and got to sit down with her doll and watch the show. Disclosure: All opinions are my own. I received a Lalaloopsy doll in return of sharing the information listed above. No other compensation was received.